Most people have a talent. No matter who you are. No matter what you are. And no matter how you are. There is always something special inside every single one of us, that is just ‘dynamic’, POW! And do you know of a great film that illustrates this very well? This one, Directed by Mark Herman; and Staring: Brenda Blethyn, Jane Horrocks, Michael Caine, Jim Broadbent, and Ewan McGregor. It was made in 1998, and lasts for 96 minutes. The crooner, Dean Martin, once sang ‘Everybody loves somebody sometime’. And do you know what? He was right you know – especially about these people from Scarborough. As there is telephone technician, Billy (Ewan McGregor), who just loves his pigeons – specifically one called Duane who has recently flown the coup. Then there is widowed dolly-bird, Mari Hoff (Brenda Blethyn), who loves the attention from men – specifically from the flamboyant talent agent, Ray Say (Michael Caine). And finally, there is Mari’s daughter and soft-spoken recluse, LV (Jane Horrocks), who loves her deceased father – specifically the records that he once owned and she continually plays. Please note, both Ray and Billy are strangely drawn to LV for two completely different reasons. For Billy, he is attracted to her congenial charm and warmth, when he initially meets her after repairing her Mothers telephone. And for Ray, he is amazed by her magnificent singing voice when, by chance, he hears her sing in her room, after an argument she has with her Mother, Mari. OK, so what do both of these men do about LV's allure then? Well, Billy tries to get to know LV through discreet encounters, in which he tries to gauge what she wants’, and what she likes’. However, Ray has a more unorthodox approach towards LV, and he tries to charm her into singing at a nightclub owned by funny-man, Mr. Boo (Jim Broadbent). Now do you think that Ray’s charm works on LV like it does her Mother? Hmmm? In a round about way, yes, it does. As by happenstance and by chance, Ray is able to coarse LV onto the stage, and... errr... sing – kind of sing – though only amidst the cover of darkness. Fortunately, Billy hears about LV's performance from a college of his, and he tries to aide her out of her plight. But Ray has other ideas, and manages to do a lot of things so that LV can perform on stage once more. For example, he manages to use LV's dead Father’s memory so she will agree to sing again. He persuade Mari to deck LV out in new clothing. He hires a band for LV when she sings on stage. Plus he gets himself into debt due to the cost of all of this promotion. Still, this all works out for the best when LV finally sings, because this time she is bloody marvelous! So marvelous in fact, that Ray sets up a viewing for LV by a top press agent at Mr. Boo’s nightclub – one involving a subsequent performance from her. But can Ray encourage Mari to get her daughter to sing again? And if not, what will his reaction to new this be? Also, will Billy play a part in this at all? Will LV sing? Well, someone sings – someone cries – airs are viewed – houses are burnt – and at the end of the day, a pigeon comes home to roost. 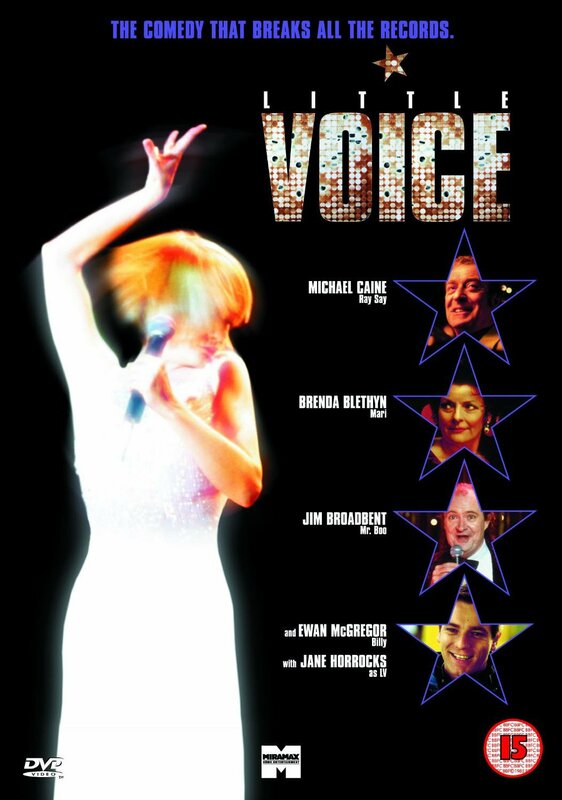 It is ironic really, that this film is called 'Little Voice', especially when it has so much to say. Well, for a start, I suppose it is us – the viewer – that has something to say - because I am sure that after watching this film, you will ask yourself one simple question. I did – quite a lot actually – through out the whole movie. Heck, at one point, I even went straight up to the screen just to see if what I was seeing was real or not. OK, I best tell you about what I mean by all of this – the question that will be posed, is – does Jane Horrocks actually sing? And do you know what? SHE DOES!!! If ever I do Karaoke and Jane sings before me, I’m gone – I can no way match her singing prowess – she is just amazing. Song after song after song, Jane is just startling to watch, and you cannot help but feel captivated by her astonishing talent. And do you want to know who else is talented in this film? The rest of the cast. Caine – Blethyn – McGregor – Broadbent – and the rest, all having that uncanny ability to create over the top charactertures, yet at the same time make them believable and grounded. Blethyn, Broadbent, and Caine are especially adept at doing this, because all three of them play bastardised versions of stereotypical 'common folk', whilst lending a congenial spirit to these characters as well. Now this is not to say that McGregor is not good in ‘Little Voice’ – as he is. But his persona is much more understated – like his character – and plays a very homely ‘love interest’ to Jane’s character. OK, ‘love interest’ is probably the wrong phrase to use. Maybe ‘friend interest’ would be better expression. Oh! And while I am on the subject of ‘expressions’ – I best explain what I meant by my opening remark. You see, I find that 'Little Voice' is film has a lot to say in the ways of society; and how communication is the key to expand upon an inner truth. Fair dues, it does put it across in a fairly broad way – because it is a fairly broad film. But that does not necessarily mean that the underlining concept of rational communication and illogical presumption, is not a valid one. Another subject that this film tackled was the passage of time – and how our own perceptions of happiness can dwindle away with age. OK, again – this was illustrated in a rather broad fashion – though the message was put across quite clearly, and nicely I might add.